Latitude: 48.041993. Longitude: -4.867500. At the far northwestern side of the I’le de Sein at the sacred place called Goulénez, just 8 kms off the Finistere Coast at Pointe de Raz, (Bretagne) Brittany, stands the restored chapel dedicated to St Corentin (Cury), a 5th century Celtic saint who became bishop of Quimper; he was apparently also the adviser and confessor of King Gradlon le Grand – whose Breton kindom of Caer Ys (or Is) was both legendary and, almost certainly, mythical. Quimper eventually being the location of his new royal palace. 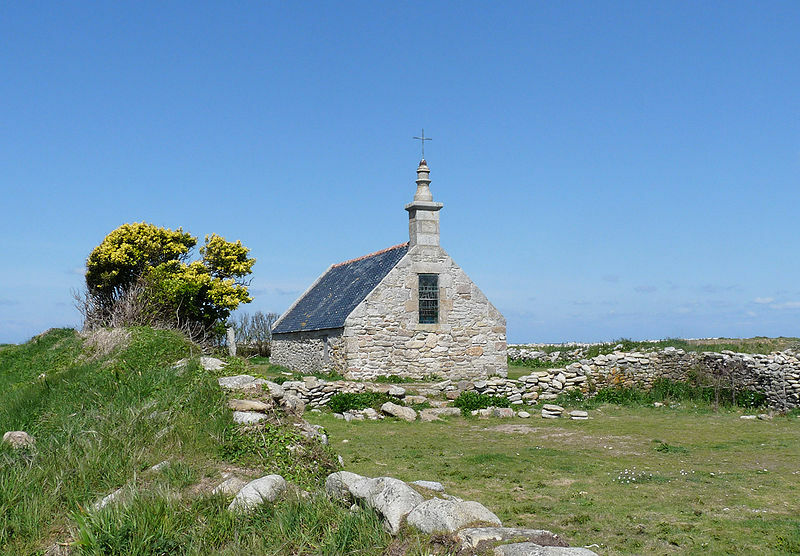 The lonely little chapel, of ancient origins but restored in the early 1970s, is a short distance from the rocky seashore of the island’s northwest coast. There is also a holy well/spring and close to that is the ‘Hermit’s Garden’. St Corentin’s Chapel and holy well have long been a place of pilgrimage and veneration for the islanders themselves; but further back into the mists of time the island was home to the druidic priestess, Velleda, and then the Romans probably camped on the island, which ‘they’ were to call: Insula Sena. 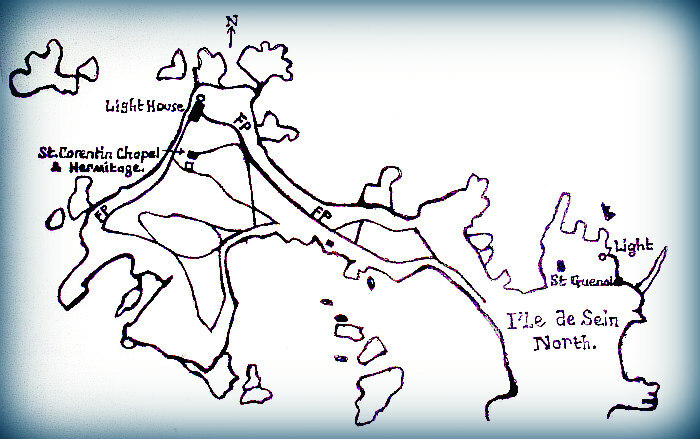 To reach the site: follow the Route du Phare coastal path around the north and northwest side of the island. The Insight Guide (1994) adds: “The home of King Gradlon, Is, was protected by a dyke and the key to its gates was always carried by the king. His daughter, named variously as Dahut or Ahés, had become attracted by the Devil in the shape of a handsome young man. The Devil requested that she steal the key to the gates that protected a dyke surrounding the king’s palace at Is. At the Devil’s request she stole the key and opened the gates allowing the sea to pour into the city. King Gradlon managed to escape on his horse with his daughter clinging onto him for dear life, but a voice from heaven informed him that he could only be saved if he ditch this evil spirit. He did this, and the sea withdrew, but his kingdom of Is was completely submerged and destroyed. “The king then chose Quimper as his new capital for the kingdom of Cornouaille, and his statue stands between the two towers of the cathedral. For the rest of his days, he lived a life of holiness and piety, helped by the first bishop of Cornouaille, St Corentin. As for his daughter, Dahut, she became a mermaid (siren) known as Marie-Morgane, and today still lures sailors to watery graves,” according to the Legend. St Corentin or Corentinus, was a native of Armorica (Brittany), but he may have visited the southwest of England and maybe Wales at some point. At least one church is dedicated to him at Cury in Cornwall, where he is called St Cury. However, he was more likely a hermit living on the I’le de Sein (440 AD), a small island in the Atlantic, just off the Finistere coast, and later at Plomodiérn near Ménéz-Hom in Crozon. St Guenole (Winwaloe) was his disciple. Indeed, St Guenole also has a church dedication on the island. Corentin established a hermitage and church on the island and imparted his holiness into the waters of a well there. The site being of pre-historic importance. A modern wood statue of the saint stands inside the tiny chapel along with one of the Virgin Mary, and other Breton saints. Eventually, King Gradlon installed Corentin as first bishop of Quimper, in Cornouaille; the Cathedral of St Corentin now stands on the site of his church. He died at Quimper in 460, 490 or 495 AD. His feast-days are 1st May (translation) and 12th December. Insight Guide, Brittany, (Ed. by Brian Bell), APA Publications (HK) Ltd., 1994. Queffélec, Henri, Un Recteur De L’ile De Sein, George G. Harrap & Co. Ltd., London, 1972. Originally pub. in French Language (1945) by Éditions Stock. Categories: Ancient Churches / Chapels, Holy Well | Tags: St Corentin's Chapel on I'le de Sein in Finistere Bretagne (Brittany) | Permalink. Since there was no 5th, or 6th, century church at Cury, no 5th-6th century St Corentin can have founded it. The church is five or six hundred years later than he purportedly existed, as is the Vita of St. Corentin, written about 1220-1235. Cury means priest (curé). Etymologists seem to think corentin is wind or ‘hurricane’ in Breton. It’s pretty windy on the Atlantic coast, presumably an elevated position or headland more so. Well that’s really what I said in my comment. I only follow what I have read in books or web. Many Lives of Celtic saints were wriiten centuries after the saint was alive. I read that St Corentin, or maybe one of his followers did visit Cornwall. St Guenole and Tudy were missionaries in Cornwall. So maybe they were the persons visiting, not actually St Corentin himself. But I hear what you say. Fascinating. Caer Is sounds Welsh and translates as Fort or Fortress Island. Of course, Breton and Welsh are very close, part of the Brythonic family of languages. As is Cornish. So interesting to see how they all connected up in the past. Quimper Cathedral, dated 1239, is built over a former Roman church. Nothing to do with ‘Celtic’ or Brythonic tradition. The Ile de Sein is another matter and more important, being a sea-marker on the long-distance Atlantic ‘tin route’. Well, much the same really, a Roman church on the site of the Cathedral. St Corentin considered a Catholic saint in later times, or adopted by the Roman Church. has been attributed to him)? St Corentin was born in Amorica (now called Brittany). He was not a Cornishman, but he did found a church there at Cury. I think its the case that the Roman Catholic Church called him there own in more recent times, like many other Celtic (Breton) saints. He was not Brythonic, at least I don’t think he was. I couldn’t find any reference to archaeological evidence of an early church at Cury. The report says the doorway is ‘typically Norman’ and stone carvings have been dated, without giving a reason, to the fifteenth century. Either way it is pretty clear there was no Cury church prior to the twelfth century but every reason to assume a Megalithic footprint was there. It is after all ‘tin country’ and without tin there’d have been no Bronze Age. I’m not really surprised about there being no archaeological evidence for a church at Cury prior to the 12th century. But the local church there seemingly adopted St Cury (Corentin) as its patron saint, and the place-name no doubt seemed to suggest that that particular Celtic saint had visited the area. Or maybe his disciples or devotees were in Cornwall, and decided to dedicate a church there after Corentin. Another possibility perhaps being there were two saints of that name, one in the 5th century and one in the 6th century. It’s a possibility.